When you want to get development work done, whom should you hire? Is it feasible to hire resources in-house or is it better to go with a freelancer? How about a web development agency? Infrastructure: You’ll need to make the infrastructure available for your employee to be able to execute their work. This means providing a working space or cubicle and the entire workspace set-up. HR: You’ll have to provide them additional facilities as per company policy. Finance: In addition to their salary, there’s accounting and taxation overhead. Others: You’ll need to ascertain if the candidate is organizationally fit for your company’s culture, is a team-player, can fit into the office work hours etc. The major factor to consider here is the project timeline. It’s not typically feasible to hire a resource in-house for a short-term project because the costs and overheads outweigh the benefits. If you put all of the above together, for a small to medium project, it’s simply not feasible to hire an internal developer or a team because of the CTC and management aspect of things. However if the project timeline spans a few quarters, an in-house developer or a team of developers are your best bet at success. There’s no communication gap, mismatch of expectation or any other excuse for failure. There’s an a abundance of freelancers as far as web development skills are concerned. They are in tens of thousands and come a dime a dozen… spread across hoards of freelancing sites each with a 5 star rating and testimonials and what not. And then there are some who have the credentials that speak for their work — their clientele, body of work, open-source contributions and people who vouch for them. There’s no 5 star ratings; and they don’t need them. These are the things that are missing with other freelancers. Provided that you hire the right one, freelancers have their own work-style, timings and this varies by location. They could be on the other side of the country or the continent. This brings up the issue of language, communication delays, communication gap and often timezones and availability. As far as you have a good one available, reliability will not be a concern for the most part. What you buy is what you get. There’s no such thing as a free lunch. With freelancer the only task is to mitigate costs vs peace-of-mind. I’ll cover this subject in detail later. This justifies a dedicated article. For now, let’s take a look at the case of a web development agency. If you don’t want to compromise with timeline, project management and anything else in the project quality domain then a web development agency is your best option. This is what sets apart an agency from an individual freelancer. Take this with a “punch” of salt. Quality and cost-wise, a good freelancer certainly will out-value a cheap agency. Serious businesses who invest in success demand enterprise-level work and flawless execution. These are best delegated to an agency as compared to a freelancer. An agency will have set processes in place to manage the project and deliver success with risk-management in place. Agencies are just small organisations who have vested interest in hiring and working with (and for) the best. In order to be successful in the long run, agencies have set processes for HR, infrastructure, work-culture, pricing structure and work-policies. They hire the best, are experienced and have a vision for success. This translates into project-success with minimal risk and management overhead. This though comes with a certain cost-overhead. It takes time, work and resources to employ the best and provide them with a conductive and productive ecosystem. Essentially there are bills to be paid and the show must run doing a stellar job at what they do. So it totally depends on you what you want to compromise with. Speaking of compromise, there’s something very important that you must understand as a client. This can’t be stressed enough. Quality, speed, budget-friendly — You can only pick two at a time. You have to compromise with at least one. 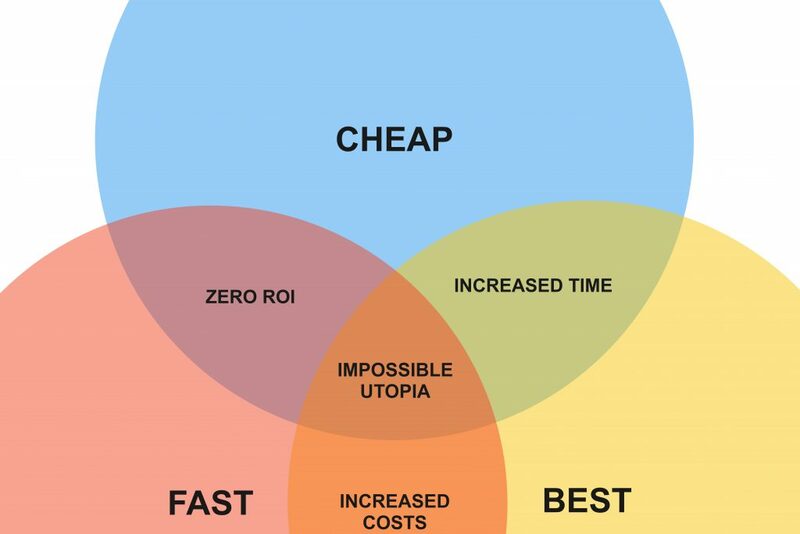 Cheap and fast is a waste. One wouldn’t want it even for free. There’s an investment of effort into whatever is delivered in the name of a project. This output however is too useless to sustain or succeed. A quality oriented, budget-friendly delivery will take time. There are higher financial stakes elsewhere. If you need solid work done fast then it costs. In any case, one thing that you don’t want is to compromise with is quality. Because whatever else you invest in a low-quality project, it’s not really worth anything; not for peace-of-mind, not for success. It’s useless. At Convertica we hold quality as the top priority. Success is only achieved with quality, especially when we plan to do business in the long run. And we get repeat business because we deliver success. Optimization of workflows and processes to save time and costs without compromising on the quality factor. This means automation of common tasks like website deployment, revision management and other optimization at various levels of the workflow. This automation minimizes the need for human intervention in routine, time-consuming tasks. Well defined processes to manage success: At Convertica we use enterprise project management tools and methodologies to manage project-success. This means everything from a small task to large projects are tracked through milestones to the delivery. This means being able to be able to monitor and identify challenges before they turn into an issue and addressing things in the nip of time. 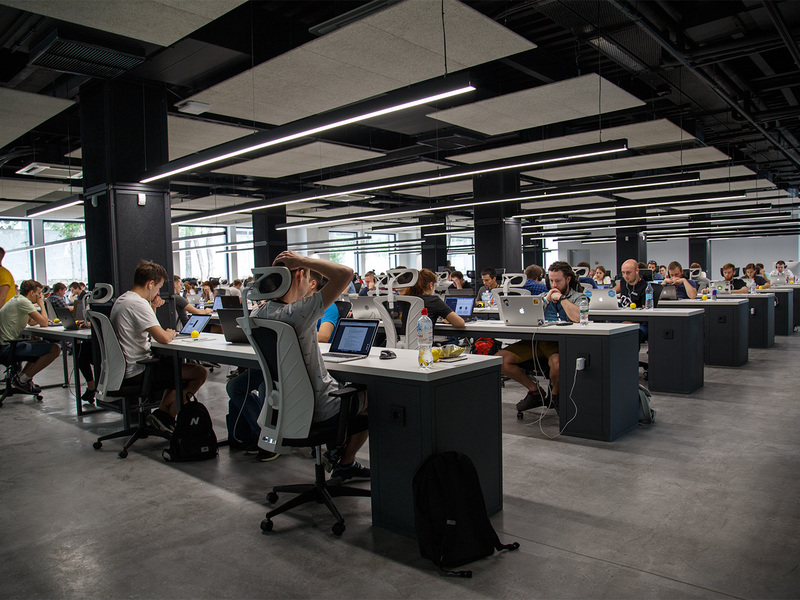 Lean, mean handpicked team of passionate professionals: The issue with running a big team is in managing, performance tracking and optimizing productivity of individuals. However a handpicked team of professionals who specialize in their very niche and who have a personal stake in excelling results in stellar efficiency. A small team consisting of creative people became the driving force for success at Convertica. These people don’t have to be managed, they are good at what they do and they are passionate about their success. This translates into reduced cost-overheads and deliver premium quality of work without blowing client’s budget. Being able to eliminate organizational-bloat is key to efficiency and business success. We work with start-up entrepreneurs and SMBs within their budgets to be their success-partners. If this is what you are looking to achieve then we are the right fit for you drop us a line.